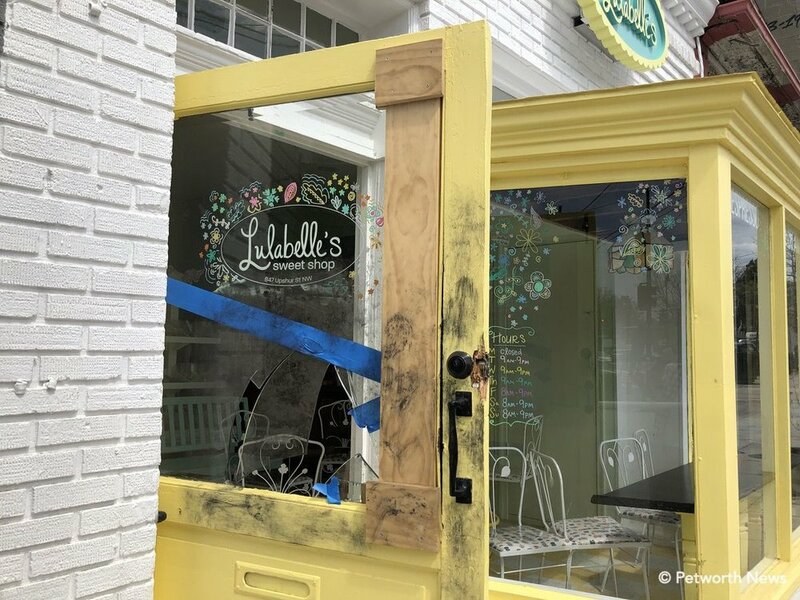 Son of a ... Lulabelle’s Sweet Shop at 847 Upshur Street NW was burglarized again last night, making twice in as many weeks. The thief or thieves first tried prying the door open, damaging the door in multiple places, until giving up and smashing the old plate glass into pieces. The front door is too damaged to fix, they believe, so they’ll need to replace it — and that’s expensive since it’s an antique, over-sized door. To help raise additional funds, they’re opening today (Monday) from 3-8pm for people to buy ice cream, candy or other items. It’ll be credit card only. The terrible people who robbed Lulabelle’s broke not only the glass but the antique door. Owner Julie Wineinger is understandably upset but is keeping her head up. “We don’t want to put a security over the front door, as that really doesn’t look good for a sweet shop,” she said. They’re looking at what they want to do to better secure the property. So swing by Lulabelle’s and show them how sweet Petworth thinks they are by spending a couple of bucks. I mean, the ice cream really is good. I’ll be first in line when they open! Any kind of crime is terrible, but it's the neighbors who make the neighborhood what it is, and #PetworthRocks. Fox 5 carried the story of the burglary and the community response!